EDIT: Session #2 is now rescheduled for Friday, October 30. The inaugural session of our new campaign was played this weekend. The first hour was spent detailing the city of Luskan and surrounding lands, and meeting the PCs: Arendeth, a dwarf battle cleric (deity yet to be named); Riwyn, a female elven mage/thief; Berwyn, a haughty half-elven wizard from a nearby fiefdom; and Wren, a half-elven fighter/thief whose past has been spent sailing between ports aboard a trade ship known as the Painted Lady. Before we began, Berwyn and Riwyn elected to cast find familiar; both succeeded, with Berwyn gaining the servitude of a black cat, and Riwyn an owl named Merlin. 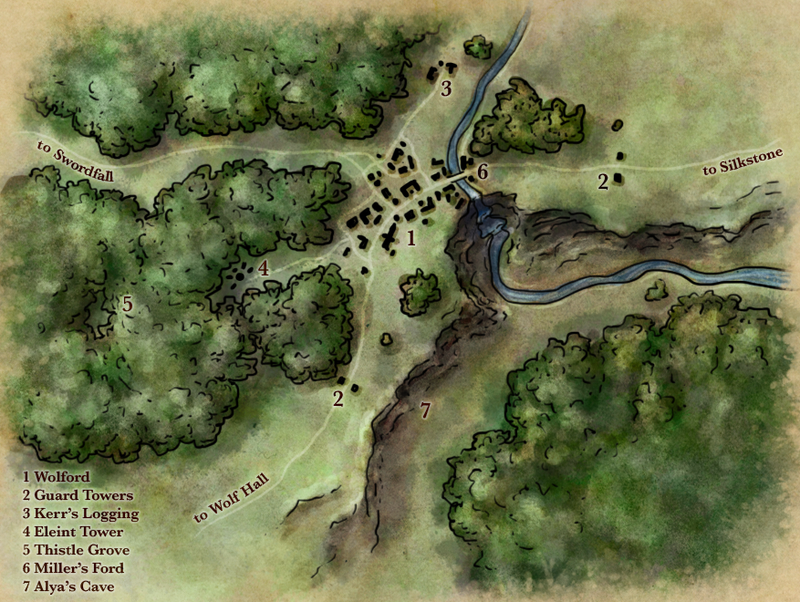 To open the campaign, the PCs had each accepted a wage of five gold pieces per day to accompany an expedition to a struggling mining village in the western Crags. In addition to suffering goblin raids from the Neverwinter Wood, the miners had recently uncovered a passage into an existing catacomb that stymied their ability to proceed. The leader of the expedition, a Luskan merchant named Armandras, offered three days payment up front (to cover the initial journey), along with a potion of cure light wounds to each PC. Armandras' exact allegiance is unknown, but presumed to be somehow tied to the city. 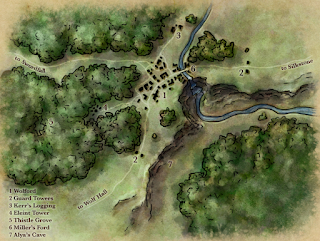 The PCs met their contingent before sunrise outside of Luskan's gates, with a charter to follow the southern banks of the River Mirar to the edge of the Neverwinter Wood before veering southeast toward the Crags. Besides the PCs, the company consisted of Armandras, four attendants, and three other adventurers: a greatsword-wielding warrior named Eyrior (previously known to have worked as a doorman at the Cutlass), a Mirabaran gnome named Pevrel (who wore a necklace bearing the symbol of Tymora), and a slinky, unarmored man named Segrim. A haul of mining tools and provisions were piled into a single, two-horse cart, driven by Armandras. The first morning was damp and overcast, typical of Luskan weather in early spring. As they marched, Berwyn seated himself next to Armandras, who did well to swallow his contempt. Before long, a rustling was heard from the woods, and a hulking form emerged. The NPC warrior charged, bellowing "Owlbear!" and veritably cleaving the monster in half (rolling a natural 20 against a large-sized opponent with a two-handed sword); although the owlbear struck back, two masterful arrows from Riwyn's short bow impaled the creature's chest and neck, laying it low. Armandras nodded, impressed. The rest of the journey proved uneventful (aside from some PC/NPC conversations during the night watches and a disturbance in the forest that Berwyn's cat helped the party avoid), and the company arrived in the village of Wolford at dusk on the third day. They were greeted at a guard post and taken to "Wolf Hall" where they met the village leader, a young, fiery-haired warrioress named Lady Sophia Ostengard. Wolford, the Lady explained, was named for Duke Daragos Wolfstar, a ruler of Illusk some centuries ago, and comprised of three main areas: Wolford; a smaller, adjacent forest-camp called Swordfall; and a cluster of tents near the mine entrance called Silkstone. Lady Sophia led the party to Swordfall, where little remained following a razing by a goblin warband. While the mining operation had been active for most of the previous year, it wasn't until winter broke that the goblin threat began to surface. The adventurers were offered three tents in Wolford, while Armandras and his laborers unloaded provisions. It was decided that the party would rest overnight and determine their course in the morning. After the sun set, Berwyn, Riwyn, and Wren milled about the camp, accompanied by a semi-reluctant Pevrel, while Arendeth slept. Berwyn attempted to enter Wolf Hall, but the glaive-bearing guard outside denied admittance. Wren attempted but failed to scale the back wall of the structure, though she succeeded in detecting a muffled conversation between Armandras and Lady Sophia inside (specifics could not be discerned, aside from a mention of "Luskan"). Next, the foursome meandered to the ruins of Swordfall, where they questioned the lone guard at a solitary, remaining outpost. The rest of the night passed without incident. At sunrise, it was decided that the seven adventurers would visit the mines, on the condition from Armandras that at least half the company returned before nightfall, in the event of another raid. The party agreed, making the three-hour trek into the foothills led by the camp's mining chief, Daks. They arrived before highsun and delved into tunnels, exploring the safe areas known to the miners before examining the freshly-resealed passageway leading to the catacombs. As they began to move boulders to gain access to the opening, the smell of rotting flesh filled the chamber. As first sessions go, this one went pretty well. Like with the Ravenloft campaign, one player is joining via Skype, and we didn't encounter any technical issues. For this game I decided to have everyone seated around a single, large table, which I think helped with dice rolling (players could easily see my rolls) and provided a good setup for Adam to see everyone, and vice versa. This is the first campaign for which I'm planning to make use of random encounters on an ongoing basis. In the past, I've employed "wandering monster" tables sparsely at best, but this time around I want to approach it traditionally, and consistently. For this session, I used the tables from OSRIC, but they proved far too off-kilter, causing me to re-roll multiple times to avoid randomly pitting the party against a 15-HD purple worm, a half-day's journey outside Luskan. Suffice it to say that time will be spent finding more appropriate tables, or building my own, if needed. Mechanically, we're using the 2e initiative and combat system, employing the concept of round "segments" for casting times and movement. The combat this session was minimal, but the one encounter we had played out smoothly. While unfortunate that an NPC took center stage against the owlbear, the PCs had decided to hold their actions and the warrior rolled a natural 20 against an ideal opponent. Such is life. Hopefully players are starting to get an initial feel for their characters. I think we have a great group, with versatile skill sets and interesting backgrounds. A couple PCs managed to shine for a moment, between Riwyn's bowmanship against the owlbear and Wren's roll of "02" against a 5% chance to hear noise. Berwyn's arrogant personality will no doubt prove both fruitful and dangerous as the campaign moves along, and I foresee Arendeth becoming an anchor of sorts, as the other three PCs already have shown a good deal of whimsy in their actions. Fun fact: the starting hp totals of the party were 15, 15, 15, and 14.5. Tonight will be the first time I've played D&D with the friend who first introduced me to D&D in probably close to 20 years (not counting pbp, or maybe a random one-off at some point?). Pretty crazy to think about. As is tradition when playing D&D with Adam, I give you... Snyder's hard pretzels and root beer! The campaign we open tomorrow night will be set in the Forgotten Realms, a high fantasy setting with decades of history told through various product authors, novelists, storytellers, and DMs. The decision to use a published world is not one that I took lightly, but one that became more and more apparent to me over the course of my planning. Everything I wanted for the setting, the party, and the individual characters continually fell into place around a specific area of Faerûn. In addition to its published history, I have a great deal of personal history with the setting. As a player, the Realms was home to my longest-lived PC, Cadazcar (of Mordenkainen's disjunction fame). As DM, my most successful in-person and play-by-post games were run in FR. The Realms provides a richness that a homebrew setting would find difficult to match. While I have a desire to homebrew again in the future, FR will provide a deep and immersive game for our group that should keep everyone invested for as long as we care to play. Value #1 - The setting must accommodate a player-driven campaign. As my planning came along, the adventuring options around the starting city felt endless. Every time the need for a hook or specific type of location arose, the region accommodated it. Nothing felt forced. The party will be free to explore frontier wilderness, political intrigue, and everything in between. Value #2 - The setting must be able to feed the primary motivations of the starting characters. When Sara recounted her character's backstory to me, a series of checkboxes ticked in my mind as I considered how the details fit the starting region. The background elements and primary motivation words given by the players (discovery, exploration, riches, and vindication) all melded. Value #3 - The setting must provide verisimilitude. There wasn't much to worry about here, as I'd not have considered a setting or region that didn't satisfy this value. None of the options I looked at involved anything gimmicky that would keep the campaign world from being believable. Value #4 - The prep work needed to run the setting must be sustainable. Having historied "anchor points" to build around gives me some helpful mental guardrails. Combined with the simplicity of the AD&D mechanics, I don't expect prep time to be much of an issue. Value #5 - The setting must "speak to me" and keep my interest as DM. My history of reading, playing in, and running the Realms gives me confidence that sustained interest won't be a problem once the party starts making the world their own through our games. A few years ago, Keith Baker wrote a great blog post on the subject of homebrew vs. established RPG worlds. I ended up reading this a few times over the past several weeks, and it definitely helped solidify the direction I wanted to go for the campaign. One of the biggest takeaways is how it's important when using a published setting to draw from the inspiration it offers without feeling overburdened by its canon. It's very much what I was able to do with Falkovnia, but even more challenging with Forgotten Realms due to the vast amount of canon that exists. The goal is to benefit from the depth and breadth of the world while still creating something that's our own. While I don't have specific plans to overhaul canon or desecrate FR sacred cows, the reality is that the moment the PCs set foot in the setting, they have the ability to enact change and cause the world to deviate from anything that might already be written or published.